Removes makeup and thoroughly cleanses the skin. Skin is clear and all traces of makeup are removed. "Inspired by Japanese skincare textures, these light formulas immerse the skin in a delectable bath of revitalizing, moisturizing mineral freshness for an authentic sensory experience. A clear gel-mousse texture that transforms into a light, silky mousse upon contact with water." Apply with the fingertips to 4 points on your face (forehead, chin and cheeks). Emulsify in small circular motions. Do not use cotton as it may be irritating. Wipe off remaining product with a tissue. Rinse with water or toner. SEAWEED EXTRACT: Assist in proper functioning of blood cells. GLYCERIN: Moisturizing agent for instant comfort and relief of dry skin. PURE THERMAL PLANKTON: Regeneration and soothing action. This is my absolute favourite face cleanser! I've mentioned this in so many of my posts before, I have extremely dry skin and many soapy, non-soapy, foamy, and gel cleansers dries me out like a dessert. cleansing milk is the only thing that's gentle enough for me. The texture and consistency of the product is like a milky lotion. It does not foam and it does not leave any yucky greasy feeling. After rinsing my face off with water, it feels like I still have natural facial oil (just a tiny bit) but once I pat my face dry. It's perfect. No tightness on my skin at all. Full make up face → Make Up Remover for Eyes & Lips → Cleansing Oil for all remaining face → Water Rinse → Pat Dry → Cleansing Milk → Pat Dry → DONE! If necessary, then I would proceed to exfoliation, masks, etc and the rest to treat moisturize etc etc. I don't use it to remove make up as I don't believe a skincare cleanser is comparable to make up removers. For the heck of the review though, I decided to do an experiment anyway. Starting off with all the products we would probably use for our entire face: Foundation, Mousse Blush, Waterproof Liquid Eyeliner, Lipstck, Eyeshadows, Waterproof Mascara. I mixed it a bit just because.. ok, I was having a little fun. Kinda gross to know that if I mixed my face together it would be like this LOL. Anyways, if I had actually blend out the make up and let it set, I think the longevity of the make up would be more accurate to resemble the actual face. 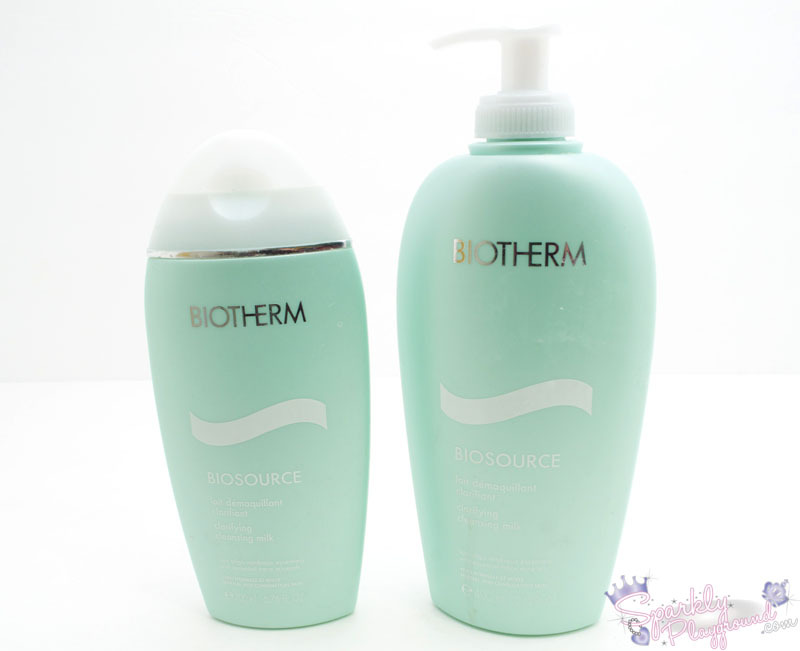 I applied 3 drops of the Biotherm Biosource Clarifying Cleansing Milk. Then, mixed it together with the make up. 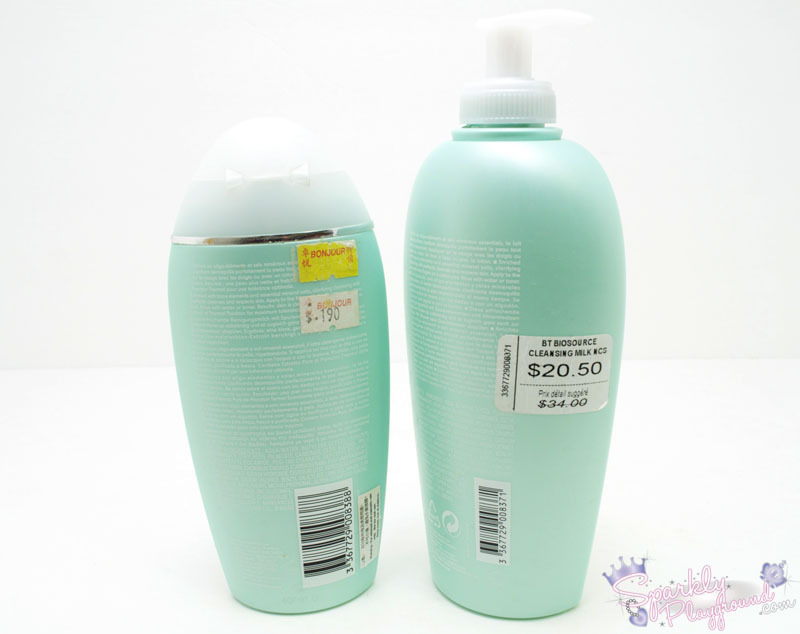 Next I used Clinque's Toner to remove as per the bottle's directions. I don't like this toner so I use this as "generously" as possible to just get rid of it. Result: there are traces of the waterproof mascara and lip stick stains. Remember that in note 1 & 2 that this cleanser is already let off easy here. You will also see on many reviews that people rate this as a poor make up remover but this product isn't a one-step cleaning product. Cosmetics should be broken down by a MAKE UP Remover so that your SKIN cleanser can work on your SKIN. As a skin cleanser, I think it did a great job with my pores and it cleans my skin well. It is good to catch my last bits of make up if I missed any. In terms of packaging, both are great! No complains at all. =) For the price, I don't think I would've purchased at the regular retail price, especially when I got both bottles at a discount. I also bought the cleansing milk in Pink as well! I highly recommend this cleansing milk to those with Dry/Combination Skin like myself. If you are acne prone, this cleanser does not help with that but to thoroughly clean. Product: 4/5 ♥ To those who are expecting this to remove make up, it doesn't do as claimed. Otherwise, amazing cleansing milk.